Metrics that Matter: Where did Drew Brees' fantasy production go? Drew Brees finished as a top-six fantasy quarterback in every season from 2006 to 2016. In 2017, he finished 11th. I tweeted this fact out about a month ago. Two different followers replied simply, “He’s done.” While I think this might be the new narrative on Brees, I don’t think it’s factually accurate. In terms of fantasy points (not really a good marker of whether a player is in the twilight of their career), this undoubtedly was a brutal season for Brees. He finished 14th at the position in fantasy points per game. He averaged under 0.5 fantasy points per game more than Blake Bortles. Only looking at games started and finished, all of Case Keenum, Jameis Winston, and Josh McCown would have finished higher. C.J. Beathard would have joined these names too, if we excluded his Week 13 game against Seattle when he was pulled late in the fourth quarter. Still, looking at more traditional metrics, Brees was just as incredible as he’s always been. Among all 29 quarterbacks to play on at least 500 snaps, Brees ranked first in yards per attempt, second in passer rating, second in adjusted net yards per attempt, and behind only Tom Brady in PFF grade. By a metric I loathe (let’s call it metrics that don’t matter), Brees set a new NFL record in completion percentage (72.0 percent), and now holds three of the top four seasons by completion percentage all-time. 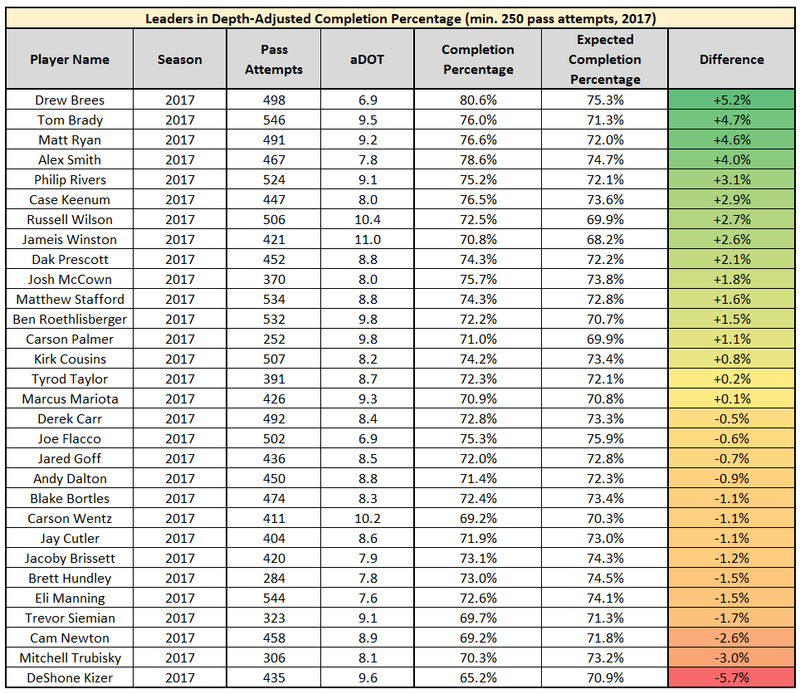 I despise completion percentage as a means of quantifying quarterback efficiency (and by extension passer rating which overvalues the importance of and double-counts completions), because completions typically have far more to do with a quarterback’s timidity than their accuracy. As you can see in the below chart, there’s an exceptionally high correlation between depth of target and completion percentage. When Sam Bradford previously set the record for completion percentage in 2016, unsurprisingly, he also posted the third-lowest average depth of target in a single season this past decade. Brees’ 2017 season ranked 18th-lowest, by comparison, and so I’m not yet willing to concede that this new NFL record is anything to get excited about. By contrasting expected completion percentage (based on the league-wide average in each season) with a quarterback’s actual completion percentage, we can determine which quarterbacks were actually the most accurate. As you can see, even accounting for Brees’ low average depth of target, he was still the league’s most accurate passer. This also isn’t exactly new territory for Brees, as he’s also the most accurate passer of the past decade by this same metric, ranking just ahead of (in order) the illustrious names of Aaron Rodgers, Russell Wilson, Philip Rivers, Peyton Manning, and Tom Brady. Matt Ryan, Jameis Winston, and Dak Prescott were all better than more traditional statistics would imply. There should be legitimate concerns regarding Cam Newton’s deteriorating accuracy as he also ranked last by this same metric in 2016. DeShone Kizer will likely never start another game in the NFL, and probably with good reason. Though Jared Goff led the league in adjusted net yards per attempt, he wasn’t especially accurate last season. Goff likely benefited from strong play-calling and scheming from head coach Sean McVay, and likely so too did Carson Wentz under Doug Pederson (especially if Nick Foles’ postseason performance has any indication). As with all statistics, however, it’s important to note this does not paint a full picture. With quarterbacks, their efficiency is always tethered to the skill of their receivers. Eli Manning ranked poorly here, but due to injuries to Odell Beckham Jr., Sterling Shepard, and Brandon Marshall, his second-most-targeted wide receiver was Roger Lewis (our 15th-worst-graded receiver). If his receivers had trouble separating, this of course would have played a role in his poor accuracy numbers. So, if Brees was just as good as he’s always been, what was the culprit for Brees’ down fantasy year? Mainly, he just attempted fewer passes – roughly 7.9 pass attempts per game below his seven-year trailing average. That’s a staggeringly dramatic change, obviously capping his upside. So the final question is, and this is one that’s trickier to answer, where should we be drafting Brees in 2018? Brees is technically a free agent, but he’s made it clear he wants to return to New Orleans. I’m not sure there’s much incentive for the Saints to move away from the more run-heavy attack that worked so well last year (their first winning season in four years). Last season, on the backs of Mark Ingram and rookie phenom Alvin Kamara, the Saints ranked fifth in rushing yards per game, first in rushing touchdowns per game, and second in yards per carry. This was only the second time of the past decade Sean Payton’s Saints passed on under 60 percent (55.7 percent) of their offensive plays. The other time this happened was in 2009, when they won the Super Bowl. As it stands, I have Brees as my No. 4 quarterback in early rankings. 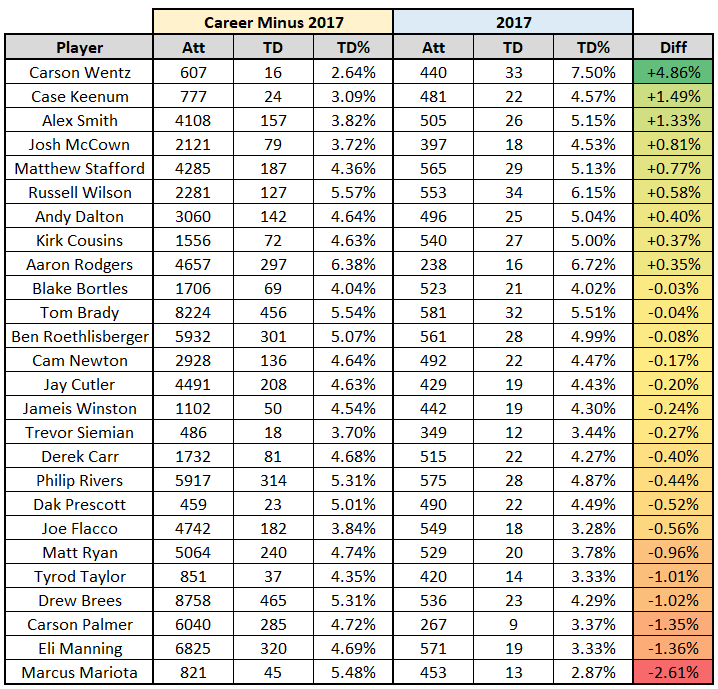 Although I’m concerned about passing volume, he’s still one of the most efficient quarterbacks in the league, his touchdown rate should skew closer to his career average, and the larger sample shows he’s as dependable as they come.